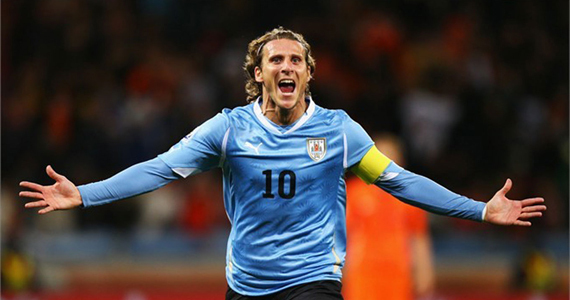 Meet Diego Forlán, one of the best fútbol players in Uruguay’s history. As I continue my quest to introduce the masses to my fellow Uruguayan countrymen, please feel free to look back at previous entries of this series. Today, we will be discussing one of the best players to come out of Uruguay in the last few decades, “La Cachavacha” himself, Diego Forlán (Diego is nicknamed after a cartoon witch). If you have heard about Forlán, then you probably watched the World Cup in South Africa two years ago. Although he has enjoyed a pretty stellar career in multiple premier leagues throughout Europe, I would definitely consider South Africa to be his coming out party. In that tournament, Forlán lifted Uruguay (Suárez was still establishing himself as the international force he has become today), one of the smallest nations in the World Cup by population, to an improbably fourth place finish (and very nearly third). Diego was so good, in fact, that he was honored with the Golden Ball, as the best player of the tournament. 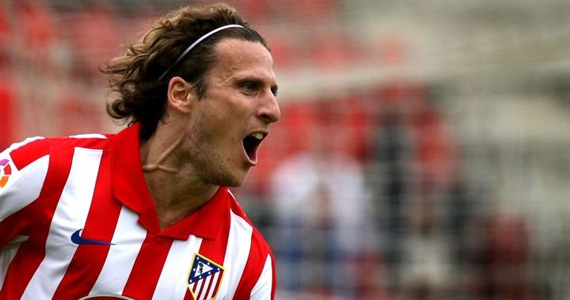 Let’s find out a little more about what got Forlán to that point though. He was born in Montevideo in 1979 to a family of fútboleros. 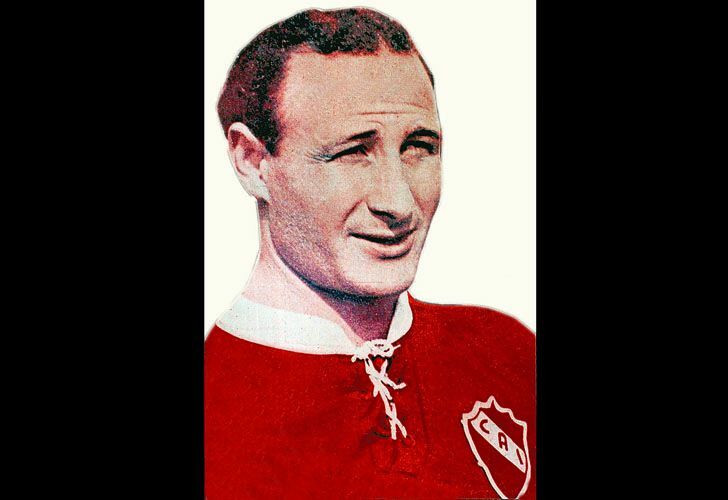 His father, Pablo Forlán, represented Uruguay in the 1966 and 1974 World Cups and his grandfather, Juan Carlos Corazzo played for independiente of the Argentine league. Diego would start his career for that very same team in 1997 before signing his first contract abroad in 2001 with Manchester United of the English Premiere League. Diego wasn’t that popular during his stint in Manchester. He struggled with his game and some injuries, and even earned himself the nickname “Diego Forlorn.” (oh, that British wit!). It wasn’t until Diego left Man U. that his stock really rose in the international game. In 2004, he signed with Villareal of La Liga (the Spanish Premiere League). In his very first season there, much to the chagrin of the United fans I’m sure, Forlán scored 25 goals and earned himself the Pichichi Trophy, which is given to the league’s top goal scorer. He built his reputation over the next couple of seasons in Villareal, but eventually moved on to Atlético Madrid. In the 2008-2009 season, he won the Pichichi again with 32 goals in 33 games. In 2009-2010, he basically single handedly won Átletico Madrid the Europa League, willing them to victory by scoring every goal the team scored after the quarter-finals. After Átletico fans turned on him following some post-World Cup ineffectiveness, he was transferred to Internazionale of Italy’s Serie A. His career has really stalled since the move. 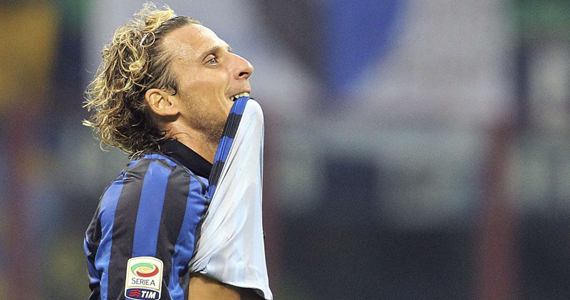 Injuries and ineffectiveness have limited his playing time, and his results both, and the last year has been a disappointment for Inter and Forlán fans alike. Internationally speaking, Forlán made his debut for Los Charrúas in the 2002 World Cup. No one in the country’s history has scored more international goals (33) than Forlán. While that record will soon be broken by Luis Suárez, it hasn’t been yet, so Diego is still at the top of a pretty impressive list of men who have played for Uruguay. He is also the all time leader in caps for Uruguay, having played in over 80 games to date. He has represented Uruguay in two World Cups (2002 and 2010), three Copa Ámericas (2004, 2007 and 2011). His two goals in the 2011 Copa Ámerica finals not only ended a nearly year-long international scoring drought for Forlán, they also helped seal the fifteenth tournament win for Uruguay, which moved them ahead of Argentina (hee hee!) for the most tournament wins of all time. With Uruguay in full swing (currently second in the standings to Chile, who have a game in hand), Forlán hasn’t really been able to contribute as much as he would like. He was injured during the games in March, and hadn’t scored a goal until the one he notched against Venezuela on June 2nd (it was a very pretty goal). It would seem as though, at age 33, Diego’s time as a star for Los Charrúas is beginning to come to an end, but every once in a while he shows flashes of the brilliance that made him one of the best players in the world just a couple of years ago. I think he can still help the team win, and I feel like the spotlight of the World Cup will help him dig down for one last run at a championship. Will he ever again be the force that he was in South Africa in 2010? It’s hard to say. Instincts tell me no, that he has been slowly passing the torch to the new focus of the offense, Suárez, but you never know. Suárez terrifies defenses so much that he can’t touch the ball without at least two defenders immediately assaulting him. This could open up a lot of opportunities for Forlán if coach Óscar Tabárez takes advantage. In Uruguay’s last game, they scored four goals, and Suárez didn’t notch any of them (I don’t care what the box score says, that was Coates’ goal). If Forlán can change his role a bit on this offense, his international career could really be extended a little longer, and he might even be able to hold Suárez off from overtaking his all-time goals record for a couple years too. That being said, I look forward to what looks like it could be a very exciting 2014 World Cup in Brazil for the Uruguayans, and hopefully another flash of brilliance from one of the best players the country has ever seen. Playing so close to home can’t hurt either, right?